North York Arts is proud to present photographer and digital artist Alex Usquiano. 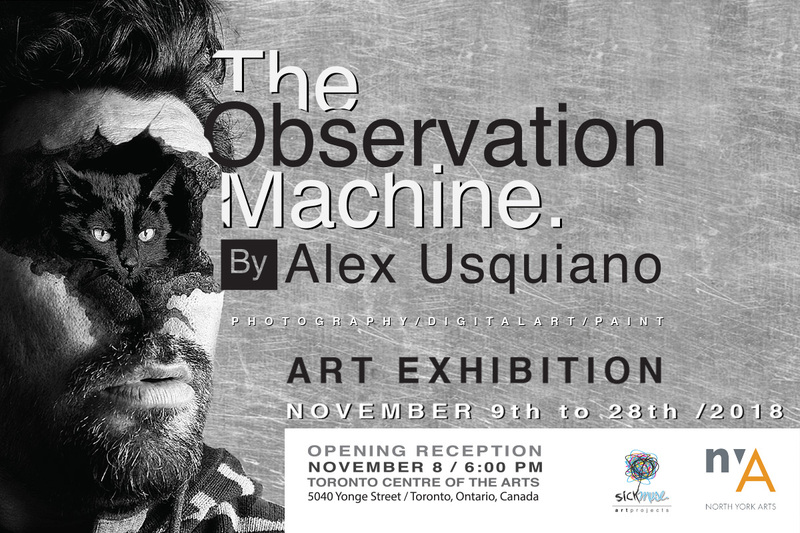 Alex will be showcasing his latest exhibition “The Observation Machine” to the North York community. In this exhibition, the spectator will find intriguing juxtapositions between artworks. The flow between the space and the works allow the audience to establish an interesting dialog between his ability to work from different platforms, materials and techniques and the creation of fantastic images without the need of labels. The Observation Machine is the liberty of exploring any medium, concept or form in order to speak what he has on his mind. His most tender and optimistic work is framed by the communitary art practice that he has been doing by the side of his personal work, nursing and extending his creativity to an impressive social and humanitarian level. This work fosters and builds a connection among artists and the community through art education to promote that Social Justice and Community Development.